With improved audio quality over the original Polycom SoundStation IP 3000 conference phone, the Polycom SoundStation IP 4000 SIP voice conferencing unit is the answer for organizations that are ready for the benefits and versatility of a SIP enabled business. Designed for offices or small to medium sized conference rooms, the Polycom SoundStation IP 4000 SIP provides remarkable room coverage. You can speak naturally from up to 10-feet away from a microphone and still be heard clearly on the far end of the call. Need coverage for a larger room? The optional extension microphones offer an increased pickup for larger rooms. Plus, with gated microphone technology, echo and background noise is almost entirely eliminated. Polycom SoundStation IP 4000 Expandable Microphone kit for use with the Polycom IP 4000 SIP Conference room Phone. 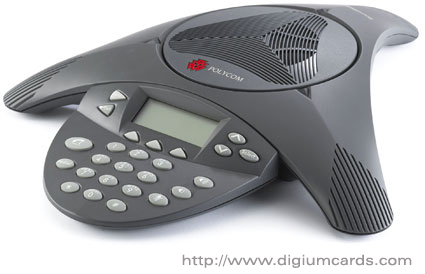 Polycom SoundStation IP 4000 SIP Conference Room Phone with SoundStation IP 4000 Expandable Microphones included.